No. 2-ranked Mott Community College won its 14th straight game on Wednesday night on the road against Alpena. The Bears haven’t played their best up north in recent years, but Wednesday night was the exception. The Bears (19-1) ran roughshod over Alpena, dominating from the opening tip to earn an impressive 82-48 win. For the second straight game, Mott held its opponent to less than 25 percent shooting — a pretty remarkable achievement at the college level. Mott sophomore Kory Billups, recently re-inserted into the starting lineup, scored 16 points in the first half and 20 in the game to lead the Bears. 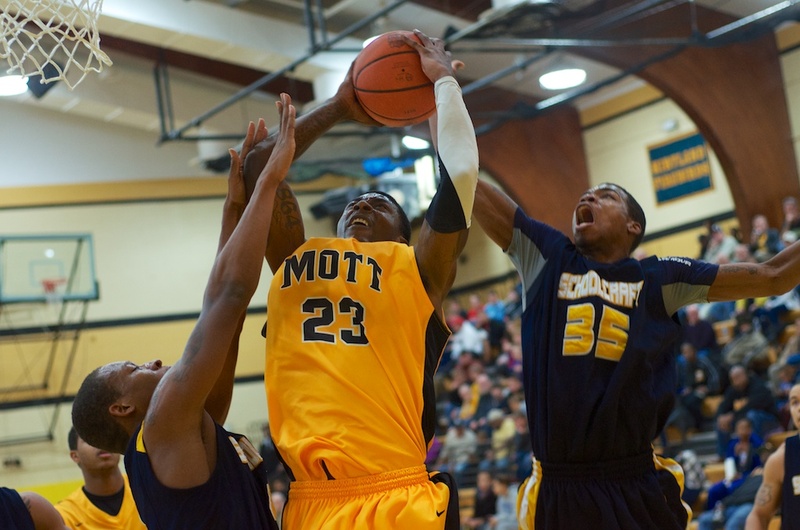 Sophomore Fred Mattison, Mott’s leading scorer this season, added 17 points and 10 rebounds. Mott, which plays five games in the next nine days, will take on Delta at home at 3 p.m. Saturday before Monday’s night clash at rival Henry Ford. Listen to all Mott games online on the Michigan Regional Sports Network (MRSN.us). Former Lapeer West standout guard Chris Hutton has overcome more in the past couple years than many players will in their entire careers. Hutton, who has returned to play for Albion College after two traumatic injuries, is one of the hardest-working players I’ve ever been around. If you’re a player and you want to model your game after someone, I’d suggest you look at this man. Two potentially life-changing injuries temporarily halted Hutton’s basketball journey but he didn’t allow them to completely block his advancement in life or the sport. Hutton nearly lost three fingers on his right shooting hand in the summer of 2011 and tore his ACL and meniscus in his leg after rehabbing for the hand injury this past summer. This year, Hutton has played in seven games and averages 8.6 points per game despite missing all of last season. Albion is currently 4-13 overall, but Hutton has averaged 16 points over the past three games and started in the previous two match-ups. He scored a season-high 21 points on 8-for-11 shooting versus Trine University on Jan. 12. That output was Hutton’s best scoring performance since the 2011 Michigan Intercollegiate Athletic Association Tournament when he racked up 24 points as a junior against Kalamazoo. My friend Patrick Hayes also wrote a great feature on Hutton after his first near careeer-ending injury. 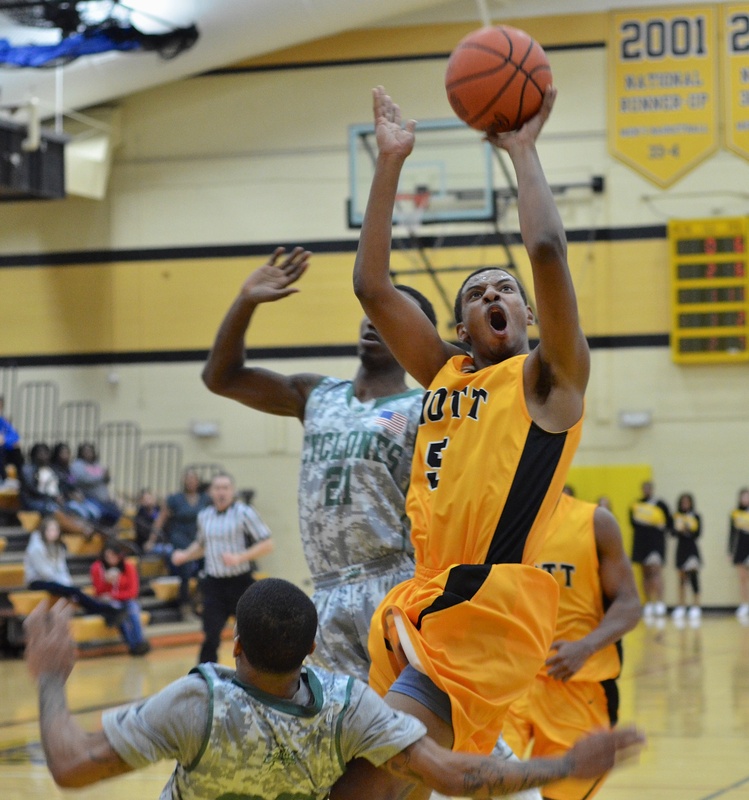 Sophomore Fred Mattison scored 19 points with nine rebounds on Saturday in Mott’s blowout of Schoolcraft. 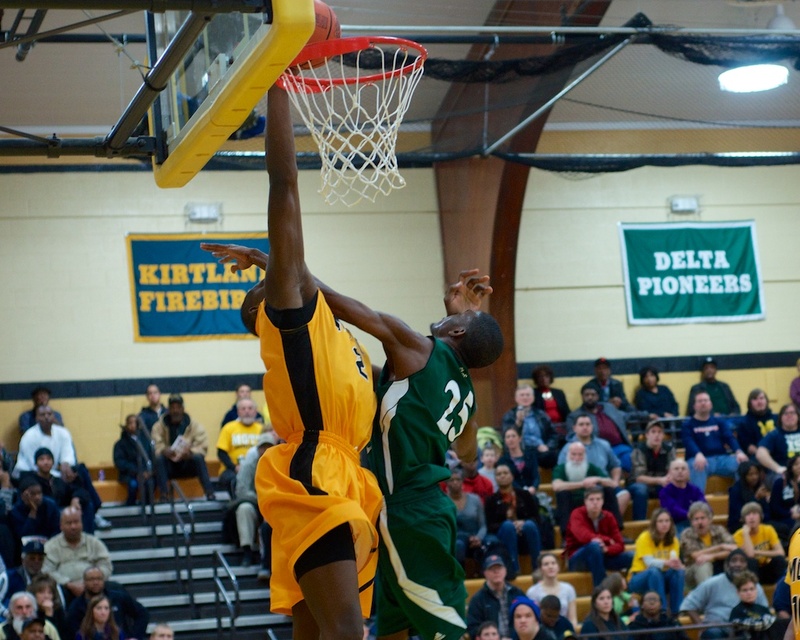 Sophomore Chavis Mattison scored 15 points with nine rebounds against Schoolcraft on Saturday. FLINT, Michigan — At the conclusion of Wednesday night’s lackadaisical win over Kirtland in the frozen loneliness of northern Michigan, Mott head coach Steve Schmidt promised to put a different team on the floor Saturday afternoon against Schoolcraft. 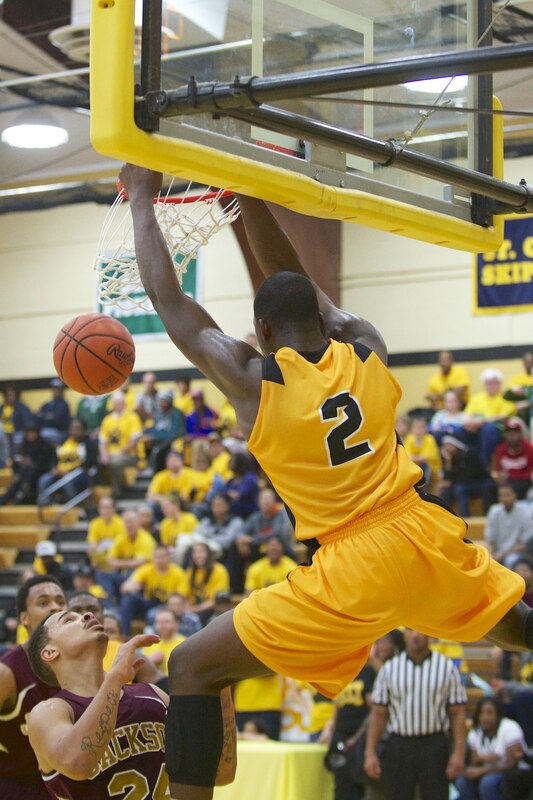 The Bears led by sophomore Fred Mattison squashed the visiting Ocelots from Schoolcraft, 77-42. Schoolcraft (4-13) led 1-0 after splitting a pair of free throws courtesy of an intentional foul, but never led again. They only managed 18 points in the first half, as Mott’s frontline of Mattison at 6-7 and Coreontae DeBerry at 6-9 simply overpowered the Ocelots. Mott led by 19 at the half before a mini-run by Schoolcraft whittled their lead down to 11. From that point, the cousins Mattison, Fred and Chavis, took the game over. The pair combined for 34 points and 18 rebounds. After the game, one of Mott’s season-ticket holders tried to convinced me that Chavis Mattison is Mott’s best all-around player. He may well be right, noting that Chavis has the size and skillset rarely seen in a point guard at the JUCO level. The story of the game was Mott’s pressure not only in the press, but also in the halfcourt. The Bears forced 22 turnovers and held Schoolcraft to 23 percent shooting for the game. For the first time in nearly two months, Schmidt paired Fred Mattison and DeBerry together on the frontline. The duo paid instant dividends on both ends of the floor. DeBerry finished with nine points, eight rebounds and three blocks in 21 minutes. Richmond Jackson and Terrance Cole scored 13 and 12 points, respectively, for Schoolcraft. Mott will take another trip up north on Wednesday night, as they take on Alpena CC at 7:30 p.m. The Bears’ next home game will be at 3 p.m. on Saturday versus Delta College. You can listen to all Mott games on the Michigan Regional Sports Network at MRSN.us. Mott Community College ran its conference-best winning streak to an even dozen on Wednesday night, outlasting a pesky Kirtland (7-7) squad, 72-61. Mott (17-1) needed a buzzer-beater in the lane at the end of the first half from sophomore Fred Mattison to take a one-point lead into the break. The Bears were all business in the second half, led by freshman guard Malik Albert who scored 12 of his 16 points in the half. Mattison scored 12 points in the first half and finished with 20. After the game, Mott head coach Steve Schmidt told MRSN’s Bill Schnorenberg he was impressed by Kirtland’s effort and embarrassed by his team’s lack of intensity. Last season, Mott just barely got by Kirtland on the road in overtime. That team ended up going 35-1 en route to a national championship. The team improved to 7-0 in conference, with a couple dangerous road games against Wayne and Oakland looming on the horizon. Mott’s 6-foot-9 freshman Coreontae DeBerry added 12 points, a positive sign for a talented player who has shown flashes of dominance. Schmidt and the Bears will be back in action at 3 p.m. on Saturday at home versus Schoolcraft. “You’ll see a different team on Saturday, I can promise you that.” he said. The in-game dunks are actually far better than the practice dunks. S/O to @PrepHoopsTV for these highlights from Mr. Basketball candidate Monte Morris against Detroit Pershing over the weekend. 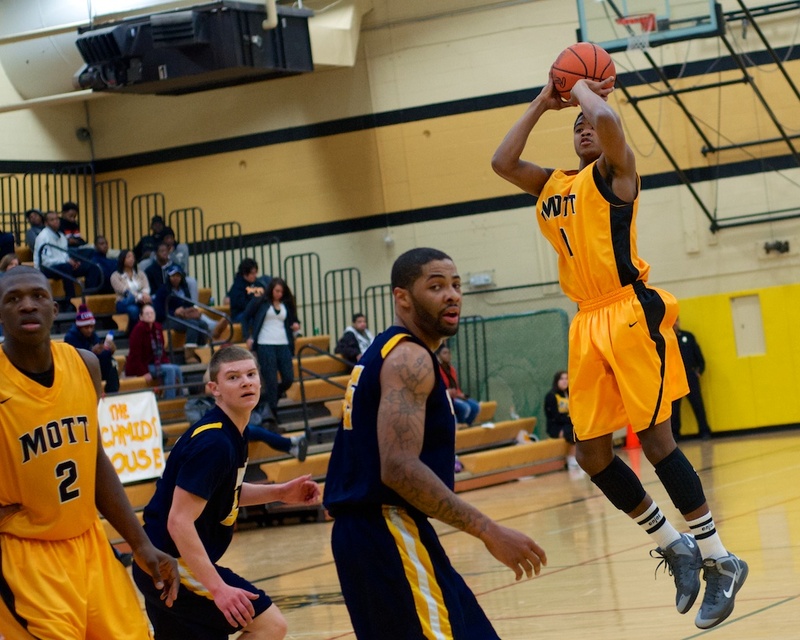 Freshman guard Malik Albert scores two of his game-high 21 points against Oakland CC Saturday. Freshman Coreontae DeBerry slams home two of his seven points against Oakland. A foul was not called. FLINT, Michigan — Zero was the hero for the second consecutive game, as no. 2-ranked Mott snapped no. 12-ranked Oakland’s 11-game winning streak on Saturday afternoon, 71-66. Malik Albert’s choice for a jersey number is probably the only peculiar thing about his game; everything else is pretty spectacular. Albert, a former Detroit King High School standout guard, lit up Oakland for 21 points, four steals, three assists and only one turnover. Much like his 18-point performance in a rough-and-tumble road victory over St. Clair on Wednesday night, Albert came through in the clutch. Albert led Mott to a 14-4 lead early in the first half before Schmidt called on his reserves to give some solid minutes to spell the starters. Unfortunately, it didn’t work out that way for Mott. The Bears frittered away their double-digit lead before Albert and the starters returned and notched it back up to as many as 16. Mott (16-1) led 35-26 at the half with Oakland (12-4) guard Aaron Hayes on the bench for most of the half with three fouls. Saturday’s big game between the two top teams in the MCCAA Eastern Conference, Mott Community College and Oakland Community College, will be broadcast live on the Michigan Regional Sports Network (MRSN.us) at 3 p.m.
Oakland (12-3) is 12th in the latest national poll, 10 spots behind no. 2-ranked Mott. The Raiders are riding an 11-game winning streak coming in to this game (Mott is on a 10-game tear of its own). The matchup of the game will be between to Brahma bulls, Mott’s Fred Mattison and Oakland’s Kallante Miller. If you’re coming to watch the game in person, get there early; this game should draw a large crowd. There’s something about that little matchbox of a gym in Port Huron that creates one of the most inhospitable environments for basketball in the MCCAA; over the past many years, Mott has not lost at St. Clair; that said, the Bears have never left feeling like they didn’t have to fight for the victory. Mott led by three at the half, trailed by as many as five in the second half before building a nine-point lead with six minutes to play. St. Clair, led by sophomore guard Johnnie Mills, made that lead disappear just more than two minutes later. With the game very much in question, freshman guard Malik Albert sucked the life out of the gym with a pair of 3-pointers, bracketing a rebound and basket by Coreontae DeBerry, in the final three minutes to seal the victory. Albert who finished with 18 points, and added some clutch free throws to his clutch 3-pointers late. Sophomore Fred Mattison led Mott (15-1) with 22 points and 13 rebounds. DeBerry added 15 and six rebounds. The player of the game was Mills, who was simply unstoppable in the second half. He finished with 31 points for the Skippers. It would be easy to assume Mott was caught looking ahead to Saturday’s showdown at home versus Oakland. Fortunately, I’ve been around too long to come to that conclusion. St. Clair is a solid program with a good coach and a couple really impressive guards. Add that to the fact that their homecourt advantage is among the best in the state. The Oakland game on Saturday at 3 p.m. in Flint should be packed, so get there early. Mott freshman Devin Foster looks to bounce back after his poor, foul-laden performance against Wayne County on Saturday. The Bears (14-1) will take on St. Clair on the road Wednesday night. Mott Community College has been steadily rising in the NJCAA national poll in recent weeks, currently ranked number two behind Louisburg College in Maryland. Louisburg (16-0) is ranked in the national poll nearly every season, though the school has not had a lot of success in the national tournament in recent years due, at least in my humble opinion, to the weakness of its league when compared to the MCCAA (or the OCCAC in Ohio). The Bears actually beat Louisburg last March to advance to the semifinals of the national tournament. On Wednesday night, the 14-1 Bears will hit the road to take on unranked St. Clair County at 7:30 p.m. The game will be broadcast live online on the Michigan Regional Sports Network. The Skippers are 9-4 on the season but have lost their last two games against two tough MCCAA opponents, Oakland and Wayne County. The Bears, meanwhile, are winners of nine straight games. St. Clair is led by sophomores Ken Bradshaw and Johnnie Mills, the only players on the team to average double-figures in scoring. The Skippers’ head coach, Dale Vos, started at St. Clair at the same time Mott head coach Steve Schmidt came to Flint. The two are in their 22nd season and, in spite of SC4’s inability to beat Mott over the years, have coached in some very competitive games against each other. 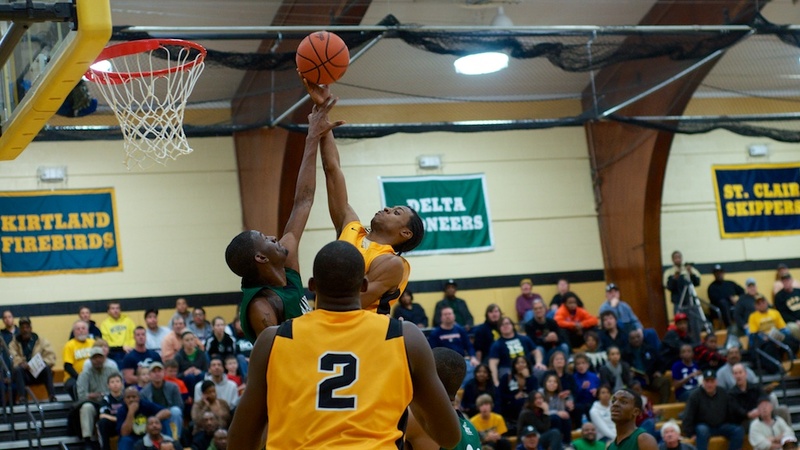 I expect a big, bounce-back performance from Mott freshman Devin Foster on Wednesday night. Foster was held out of most of the game versus Wayne County on Saturday due to foul trouble. He’s arguably Mott’s most talented player.